We’re proud of our business-friendly environment and are committed to creating the best possible conditions for the economic growth of Newcastle and the wider North East region. Quite simply, we think it’s the best place to start and grow a successful business! Believe it or not, many people outside of the region still don’t see us as we really are or know about the benefits of choosing Newcastle to locate their business. Outdated perceptions can be a barrier to us getting on the location shortlist of companies looking to relocate or expand and that’s why we need help from Business Ambassadors to spread the word. We need you, the people in the region, those who are proud to call it home to tell the world about why it’s a truly great place to do business. Whether you’re the foremost specialist in your field, the head of an international company, ten generations Geordie, or just settled here a few of months ago; it doesn’t matter, you’re a perfect Business Ambassador. There’s so much to tell about the place, we’ve created this site to provide a helping hand. When travelling for business you can use these resources to help champion the city and the region. If opportunities for inward investment partnerships and collaboration arise we can support you in taking forward potential leads. By spreading the word and being proud of our city you are raising the profile of Newcastle as a place to bring business. This not only helps our economy grow and thrive but it also opens new potential business opportunities for yourself. So take a good look around. We guarantee there’ll be stuff that inspires you and can help you to inspire others. If you are interested in getting regular updates and information about Newcastle please leave your contact details below. This can ensure that you have access to all the latest information about activity taking place that will affect the long term economic growth of Newcastle and the North East. • Proven track record – We have an impressive track record in the attraction of overseas investment as well as establishing and supporting home-grown businesses. This including includes FSTE 100 Sage Group plc, which- was founded in Newcastle; Ubisoft - , one of the world’s leading publishers of video games; , Ubisoft, and globally recognised Virgin Money. 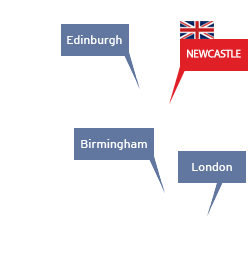 • Talent - Newcastle boasts over 337,000 people with NVQ4 skills (First degree level), andlong with a multicultural, skilled and balanced working age population of over one million – all within a 30 minute drive timeof the city. This providing provides tremendous opportunities for employers to recruit a highly-skilled workforce. Labour costs are highly competitive, while employee turnover and absence rates are significantly less than the national average. • World class academia –Newcastle boasts five outstanding universities and 20 exceptional further educational colleges within an hour’s drive time. We also have the highest graduate retention rate outside London (46%). Areas of excellence include medicine, engineering, computing sciences, business management, law, and art and design. • Outstanding research – Newcastle is home to research facilities of an internationally competitive standard, specialising in information technology, marine research, biotechnology and pharmaceuticals. Most recent is the innovative Neptune National Centre for Subsea and Offshore Engineering, the first of its kind in the UK. In addition The Institute for Ageing and Health at Newcastle University is the largest of its kind in Europe, and in 2014 the UK government announced a £20 million investment to part establishfor the National Centre for Ageing Science and Innovation, enabling Newcastle to take be a global approachleader. Newcastle University is also ranked number one in the UK for Computing Science research impact. • Quality of life - Beautiful countryside and stunning coastlines just minutes outside of Newcastle city centre combined with a vibrant culture and leisure offer provide an outstanding quality of life for residents. Cost of living is among the lowest of UK regions and house prices are 33% lower than the national average , so you’ll have more disposable income too! • Cost competitive - From Grade A office space on our stunning Quayside, to quirky, creative and digital hubs and easy-to-get-to business parks on the fringes of the city centre; there is a whole host of quality places in and around Newcastle city centre to base your business. Office space is available at around 20% cheaper than other UK cities and 63% less than London. 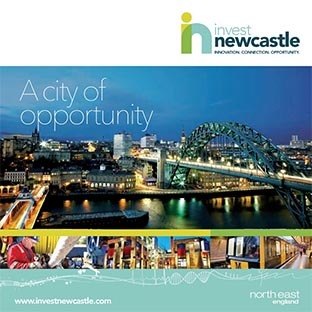 • Connectivity – Benefitting from a significant programme of investment to the road, rail and metro networks, Newcastle has all the transport links you’d expect of a major European city. The high-speed East Coast mainline provides fast and regular train travel, with over 30 trains per day to London. Newcastle international airport is 20 minutes from the city centre by metro providing flights and connections to over 85 worldwide destinations. Our three deep sea ports are served by frequent international shipping connections. As part of the Northern Powerhouse, journey times to other Northern cities and London will continue to improve connecting Newcastle quickly to the major UK destinations. Businesses have access to super-fast broadband and city wide public wifi. Our compact yet bustling city, with collaborative environments such as The Core, is make us the ideal city place to collaborate, connect and innovate with athe thriving network of experts. • Forward-looking city - Newcastle has been named Most Sustainable UK City, two years running. The city is now at the cutting edge of revolutionary low carbon technology like fuel cells. Together businesses, the public sector and universities are committed to continue innovation - , from smart heat networks to making it easier to get around the city. We can provide the expertise and service chain that will enable businesses to keep their carbon footprint and costs down, ensuring that they can benefit from, and yet still contribute to the city’s success. • Accelerated Development Zone – Four sites across Newcastle and Gateshead have unlocked a £92m investment programme across our urban core, including Newcastle Science Central, Stephenson Quarter and East Pilgrim Street. The Accelerated Development Zone spans 80 hectares, creating opportunities for developers and occupiers.